There’s something about the first snowfall of the year (that sticks to the ground) that makes it magical, even when that first snowfall is in February when the rest of the Northern Hemisphere is sick and tired of snow. 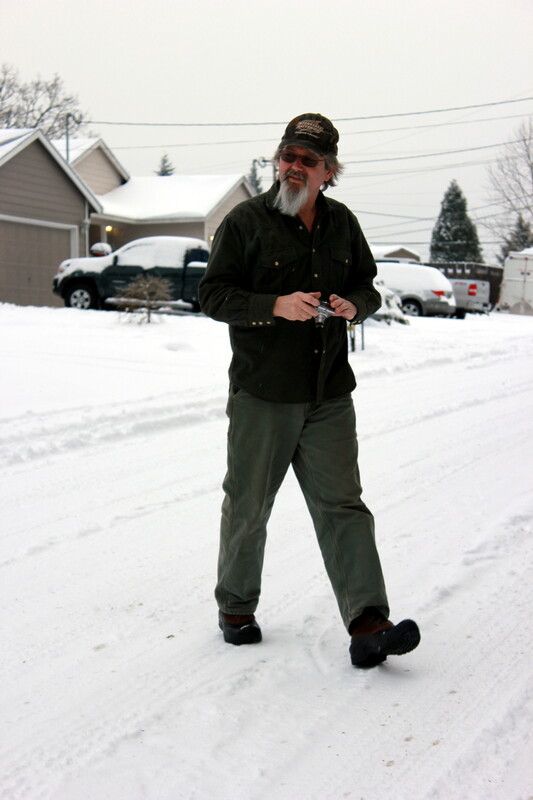 I recall how much I hated February snow and slush before I moved to the Willamette Valley. 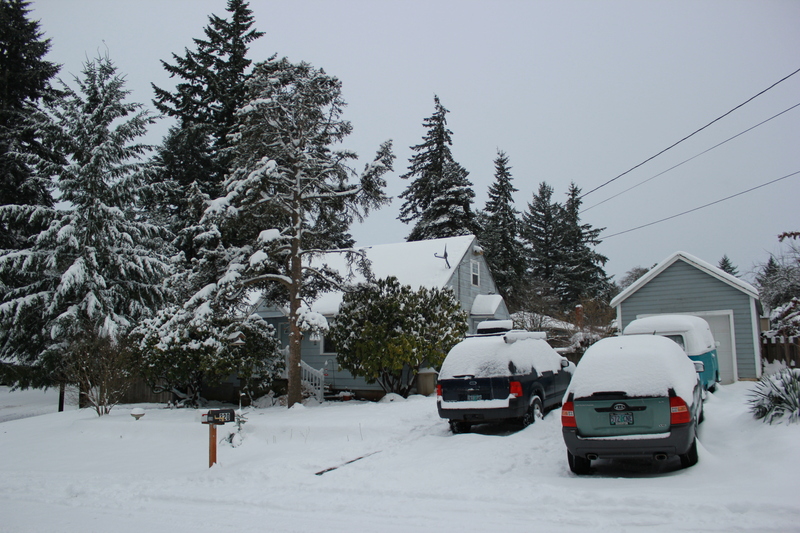 We get some of our best snowfall in February, here in the lower end of the valley, and I now look forward to February snow. That is, as long as I am not at work, don’t have to drive on any of the Interstates, and it falls on a weekend. They closed the office on Friday: instant three-day weekend. I didn’t have to worry about calling in and saying I wasn’t making the 23-mile drive after all. Score that for this snow: I didn’t get caught up in the normal gridlock for more than the normal amount of time, I didn’t have to call in, it came as close to a weekend as one could hope for, and I could just enjoy the snow. Harvey, of course, was delighted, and declared so loudly. 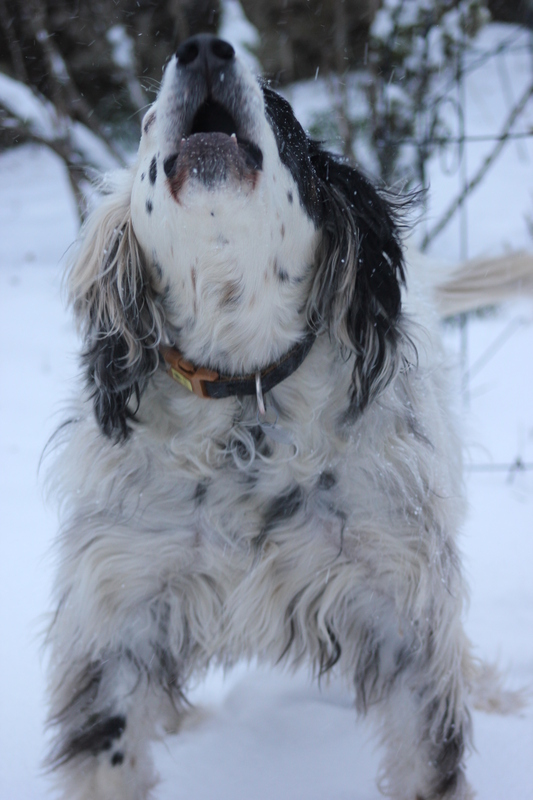 I had to trim the hair between his toes and up the backs of his legs because of the ice balls, but otherwise he is a snow dog. 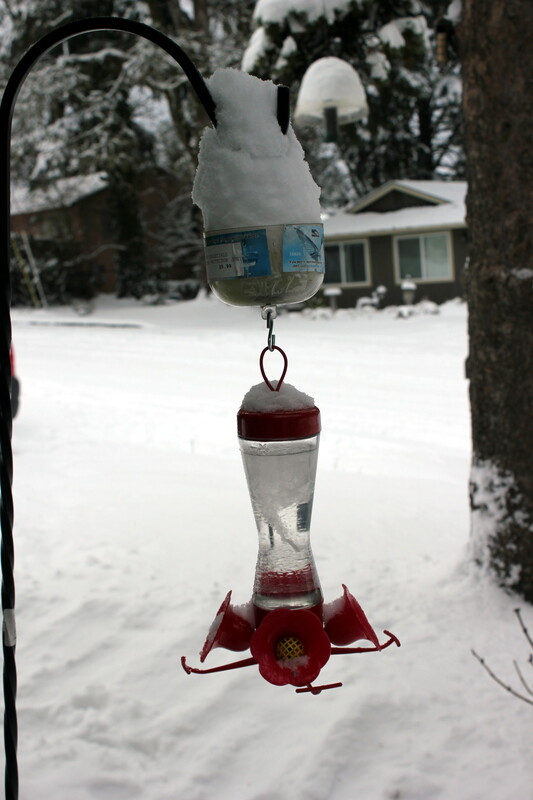 Any time it is below the freezing mark, we switch out the hummer feeders: two in the house to thaw and two outside for the birds. 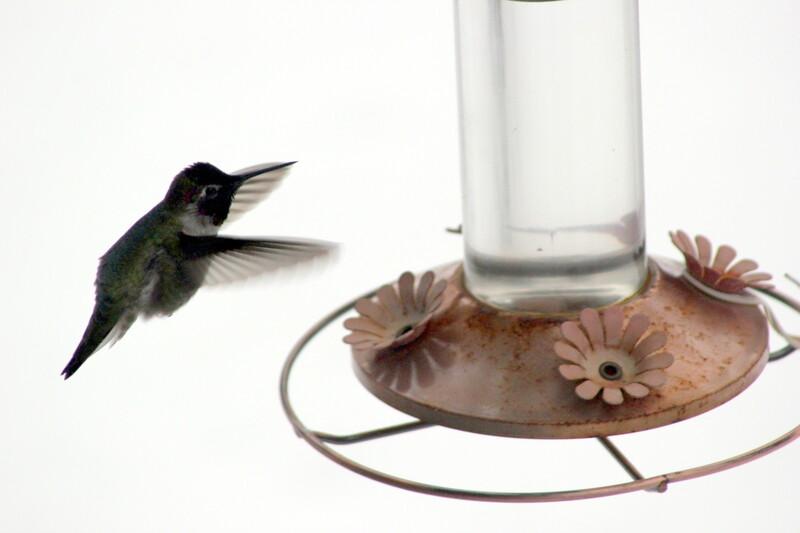 This is well appreciated by our native Anna’s hummingbirds which overwinter in the valley. 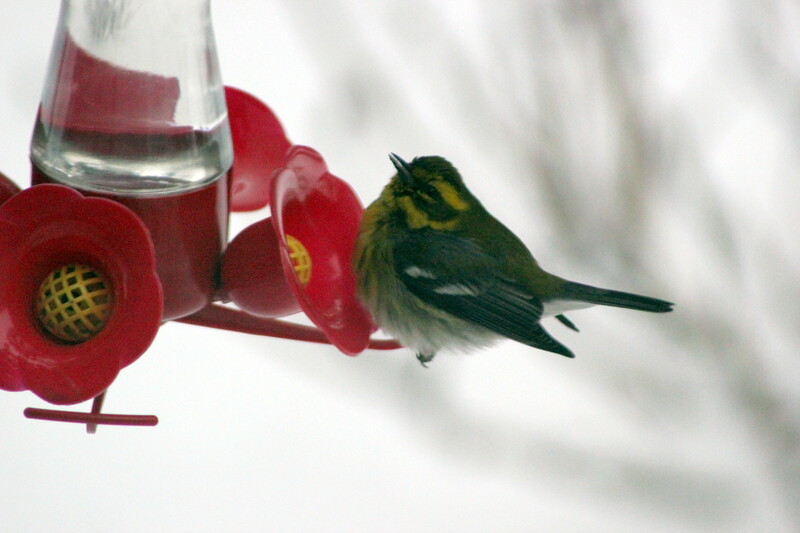 It is also appreciated by a couple black-capped chickadees and this Townsends Warbler. Where is that buzzy bird? This is *my* feeder and it better not try to move me! 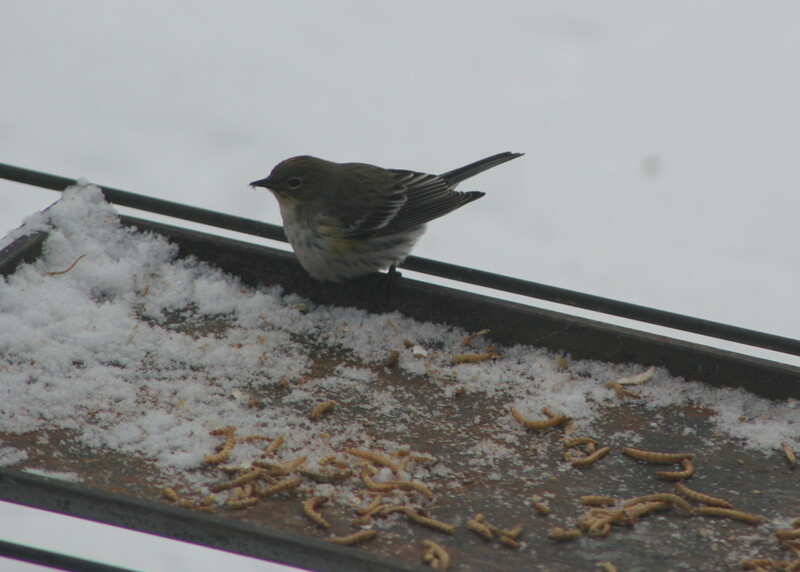 This snow brought us a bird that I haven’t had in my feeders for a long time: Audubon’s Warbler (the western version of the Yellow-rumped Warbler). So pretty! 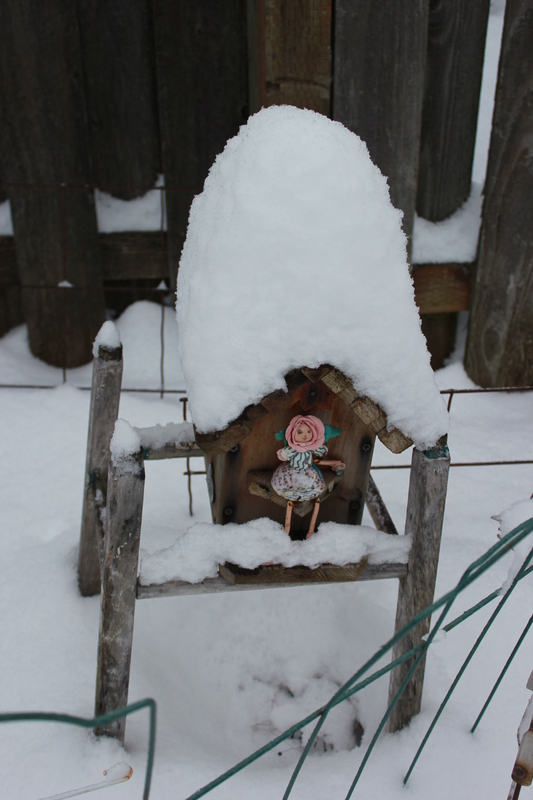 I had to keep brushing the snow away from this feeder, which is frequented by the ground birds: Spotted Towhee and the Dark-eyed Juncos, among others. 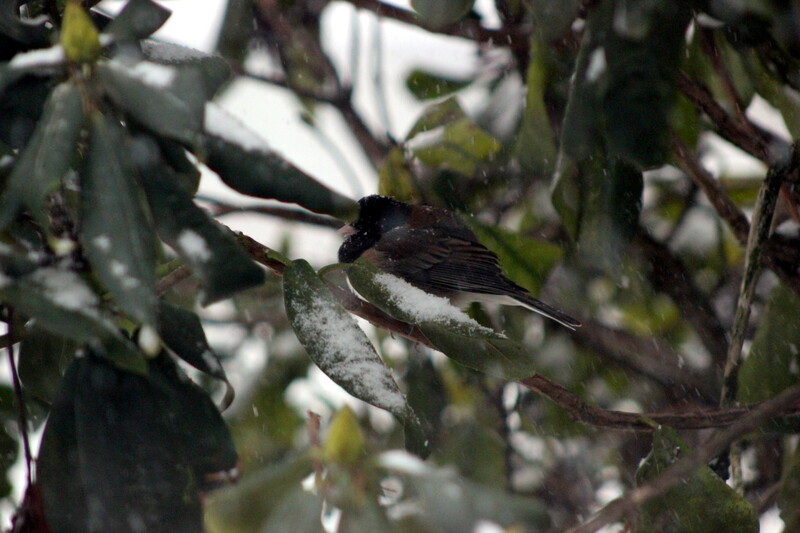 The Towhee was out there, but refused to cooperate with a photo. 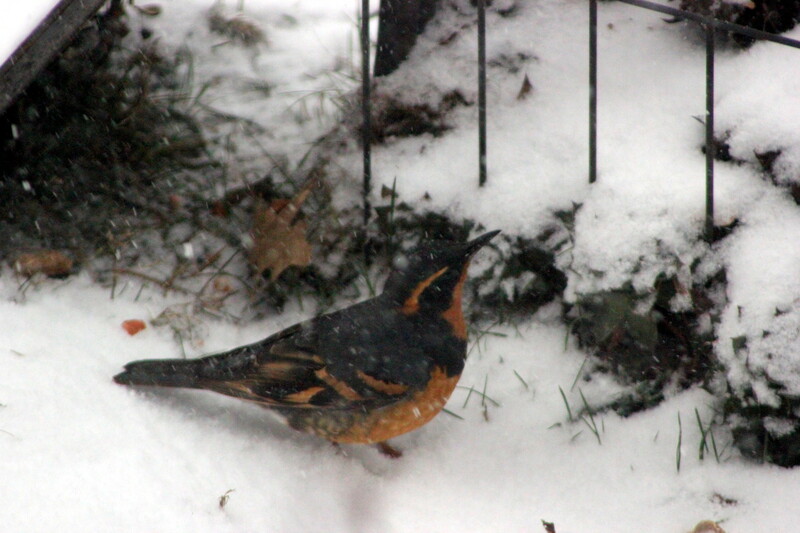 We had four Varied Thrush come in. 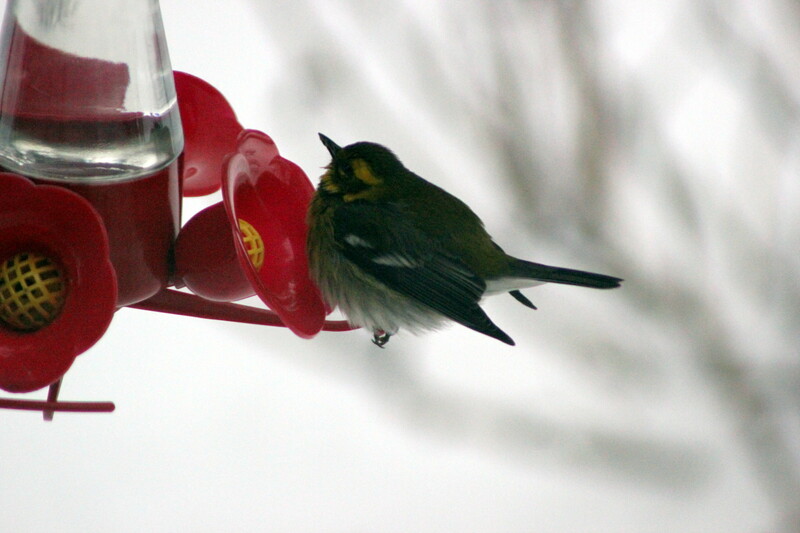 I felt sad for them because they won’t go into the backyard where the other ground feeders were, but it hopped around on top of the snow out front, looking for spillage from the front yard feeders. 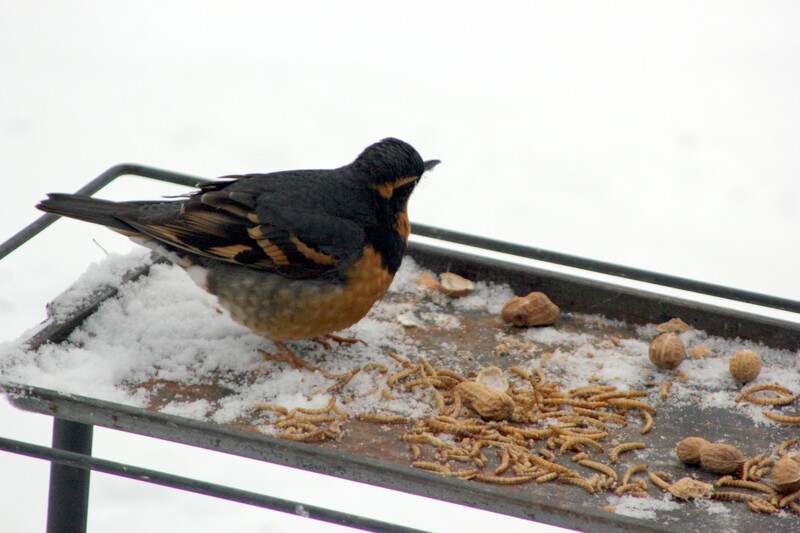 So when I put our peanuts for the jays, I tossed out mealworms, too. The thrush ate the peanuts first. Who knew? “Baby! 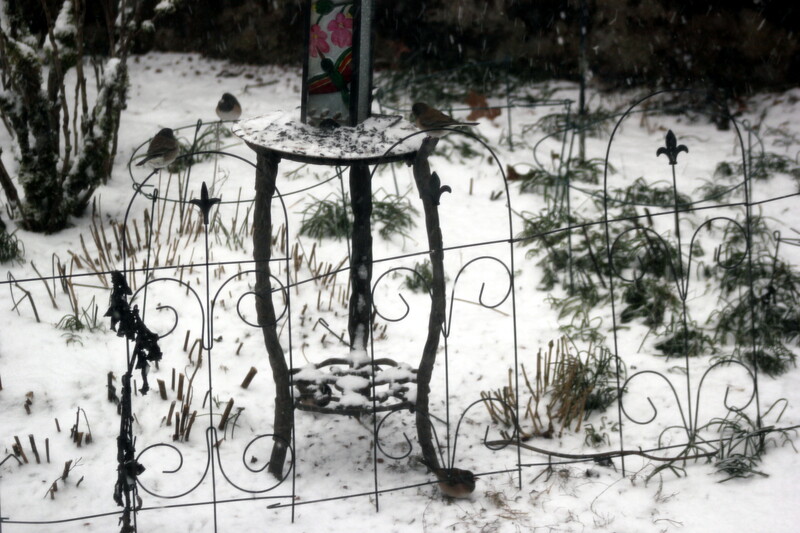 It’s c-c-cold out here!” Dark-eyed Junco takes five. 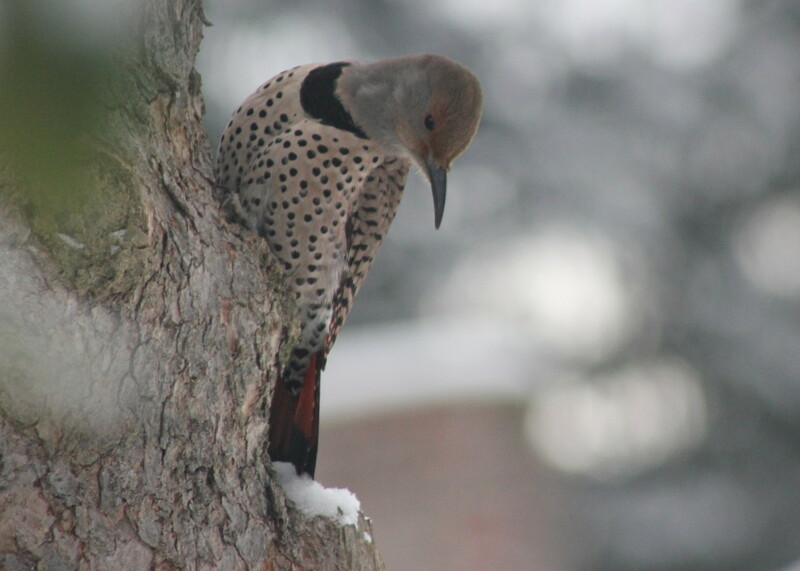 The Northern Flicker (formerly Red-shafted for the red feathers in it’s tail) paid a visit. This is a female (no red “moustache”). 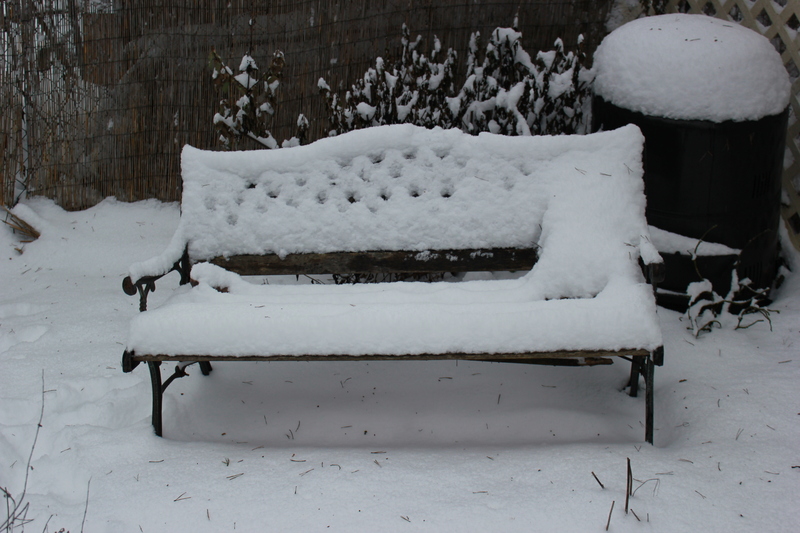 There’s always the requisite “our house in the snow” photo that has to be taken. Snowfall like this is rare (last time was four years ago). A photo taken from the right angle gives the impression that we live out in the woods and the tall Douglas firs that stand in neighbor’s yard and line the busy side street give the appearance of forest. We don’t: there was a lot of traffic on the side road: sledders, skiers, snow-boarders, and cars. And people walking dogs. Harvey had to go for walks. 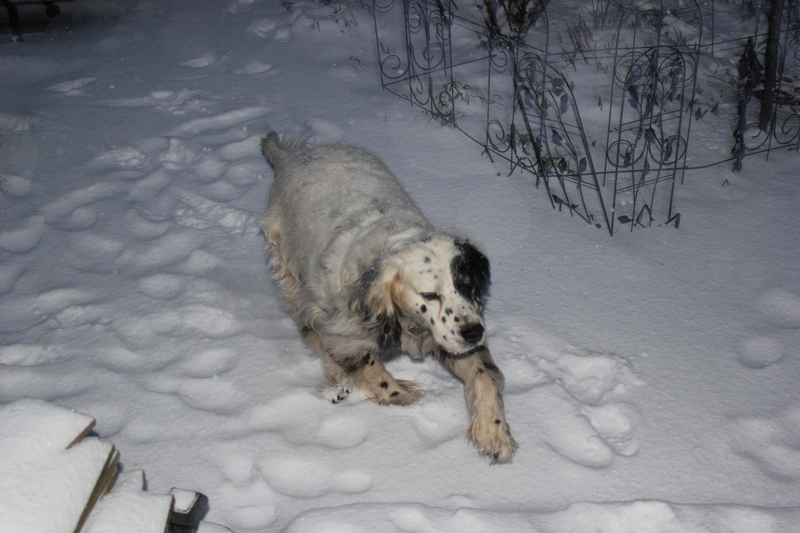 We walked in the middle of the street on the side roads so he wouldn’t have to wade in the deeper snow. The Retired Man crossing the street to take a photo with me. 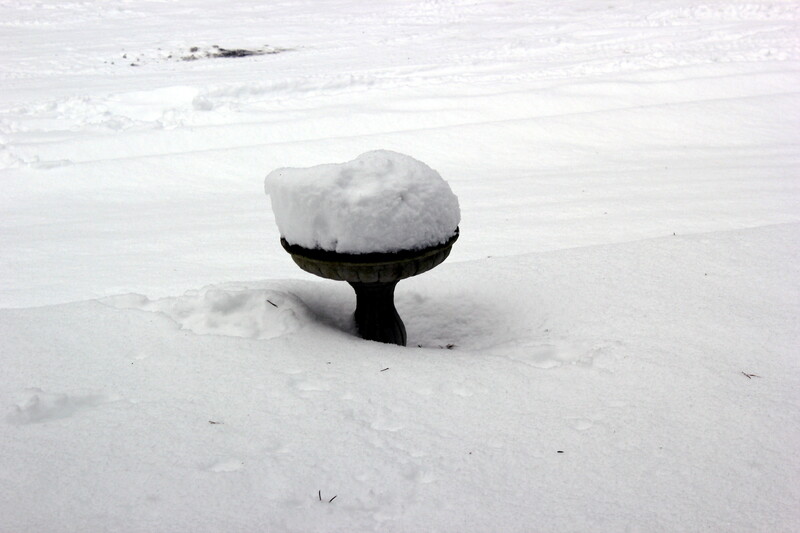 8-9 inches of snow fell over two and a half days, which isn’t much – not even for here – but it is plenty. 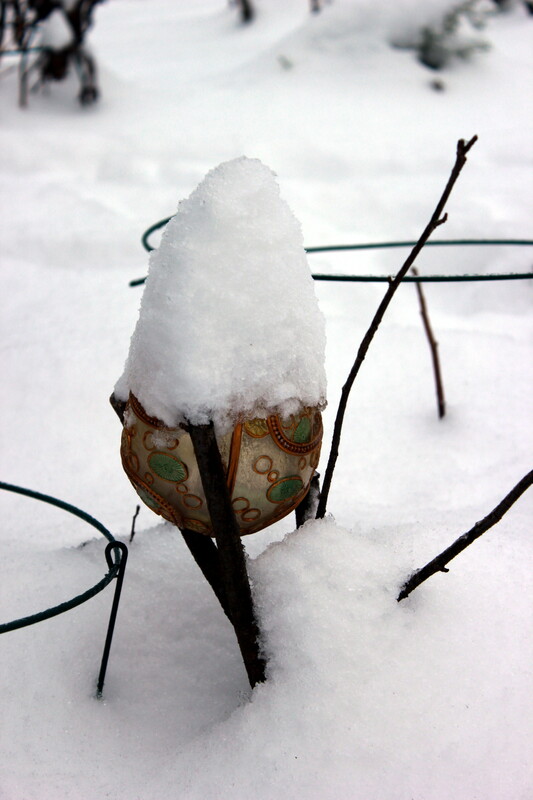 Snow makes ordinary things interesting. 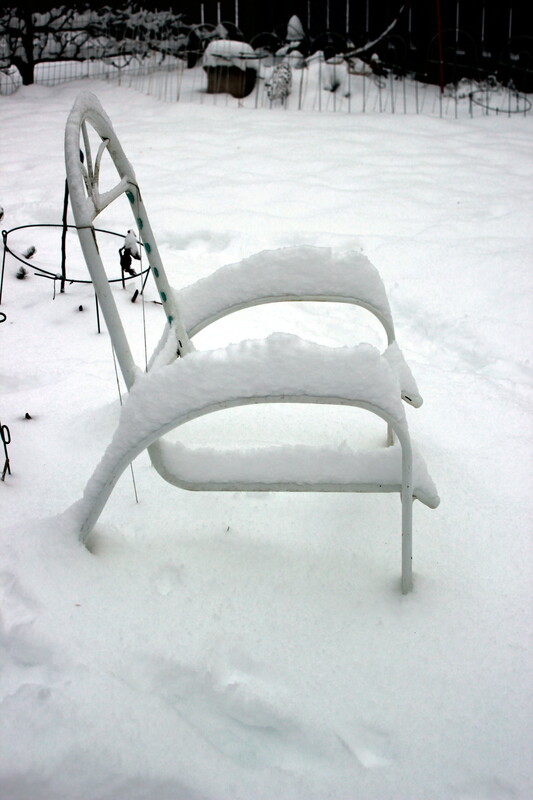 Lawn chair frames – used as plant supports in the summer – become works of art in snow. 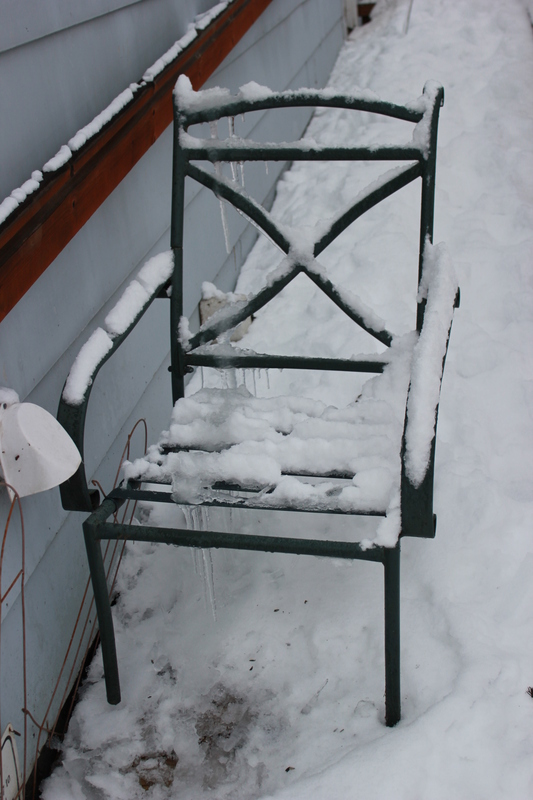 Or frames for icicles to form on. 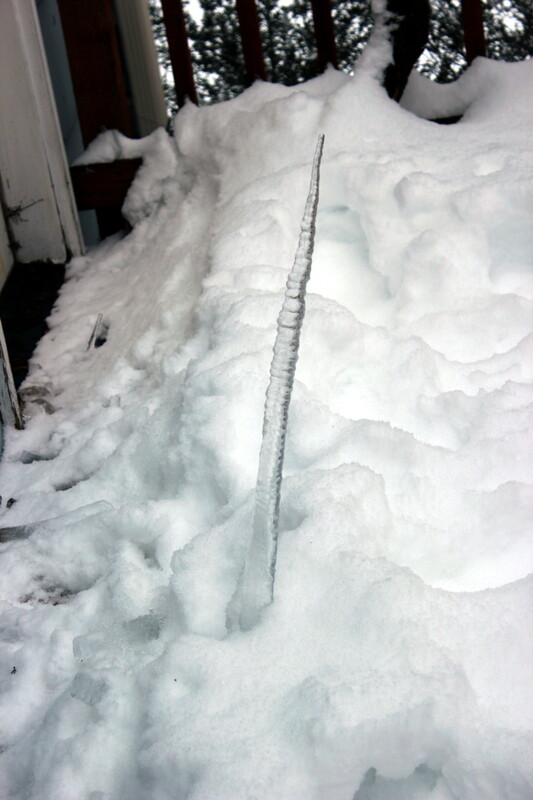 Speaking of icicles… This fallen one looks like a murder weapon! The bird house on stilts becomes a cozy cabin. The freezing rain began falling around 4 this afternoon. It will be interesting to see what tomorrow brings in terms of freeze or thaw.